Been avoiding Google+? Too bad! 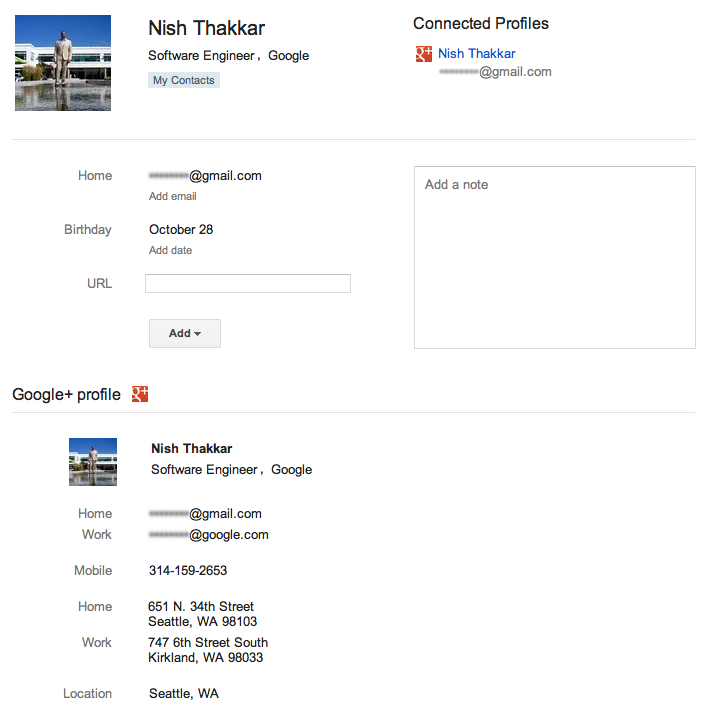 Google announced today that Google+ is being deeply integrated into both Gmail and Google Contacts. 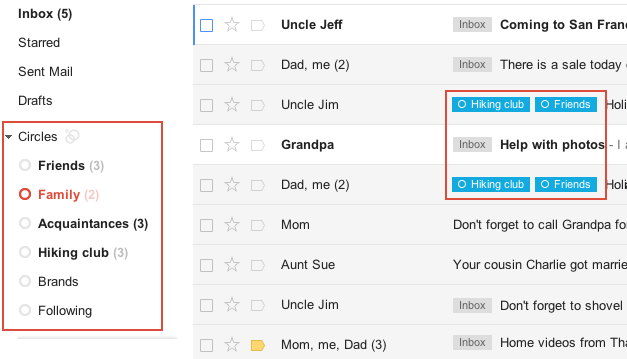 Through a widget on the side of your Gmail screen, you’ll be able to see the most recent Google+ post from the person whose email you’re viewing, and you’ll be able to add them to your Google+ Circles right there. 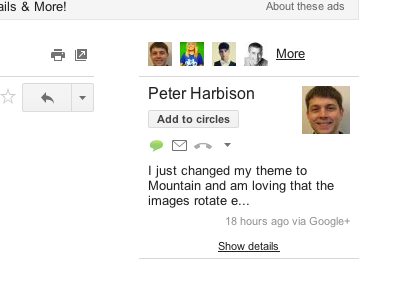 You’ll also be able to sort your email and your contact lists using the Google+ Circles you’ve created. But the absolute best part? For any of your contacts who maintain a Google profile page on Google+, Google will automatically update your address book with their most recent contact information. Oh hey, look at that. Google+ just got interesting. I’m not saying that Google+ wasn’t interesting before – anyone who takes on Facebook at Google’s scale is certainly worth watching. Besides, Google+ has that nifty Hangouts thing, you know. But this automatically updating address book, courtesy of Google+, may end up being the key selling feature for the whole shebang. Very few companies have been working on attacking the social address book with any real gusto, and the ones who do try to make sense of the thing, like Gist, for example, get acquired. There are several online and mobile apps and paid services, like Plaxo, as well as those annoying emails begging you to update your contact information please, oh, please. With an automatically updated address book, Google is leveraging one of its key strengths – the 200 million+ Gmail users – in order to attack Facebook in an area where it struggles. Due to Facebook’s bungling of privacy issues over the years, many mainstream users are wary of inputting their contact information, like their home address and phone number, into Facebook. Google, however, and especially Gmail and Contacts, are seen as utilities. It may be a bit creepy here too, but the benefits of an automatically updated address book will outweigh the risks for many of Gmail’s heaviest users. While this may be the biggest news from today’s announced changes, there are several new features coming in addition to the Gmail/Circles integration and the new social sharing and filtering mechanisms. 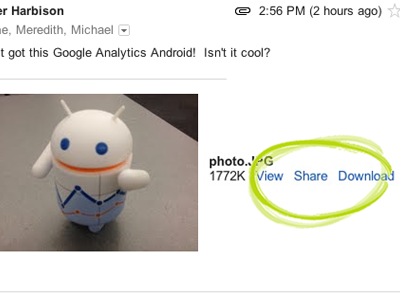 For example, Google is also introducing a way for friends to share emailed photos on Google+ through the addition of a “share” button alongside the “view” and “download” buttons it already includes next to image attachments. Some people, especially those who have traditionally used email to share the photos that are not meant to be posted online, may be less thrilled with that particular change. You can read about all the new changes in Google Contacts and Gmail on Google’s blog post here. The updates will roll out over the course of the next few days to Gmail users. Google Apps users will then follow.